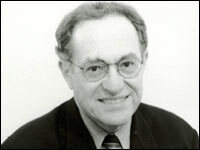 Alan Dershowitz figured out how the Ivy League maintained an anti-Semitic policy. They'd appoint a scholar to head each appointment committee, sometimes Dershowitz himself. Then when they chose a WASP as professor they'd say "scholar himself was head of the appointment committee." Same thing today. Politicians say they won't pass bill. They need safeguards, amendments. They explain why they are opposed. Stock market cracks. See, don't blame us. The whole thing would have crumbled unless we did somethin'. Albert Jay Nock would have loved it. Another example. Once I was made head of committee to determine amateur status in squash when I was still an amateur and threatening to turn pro. There are plenty of us Jews in the Ivy League. We've never had it so good. And it's only getting better. Alan is hardwired to complain. Those of us who know him — cut him slack. But outside the U.S — My G_d! Anti-Semitism is dripping thick. So, enough about all these phony baloney committees already. The WASPs are the ones sinking — have been for the last three decades.